And now for the interview-don't forget the links to get yourself a copy of this novel are at the bottom of this post. Thanks again to Jane for answering my questions! Writing chicklit novels happened by accident when I got Kate Walker’s book on writing romance novels out of the library. I was meaning to get some exercises for a writers’ group, but I read the whole book, and I was hooked. I used to work full time, doing up old houses, but after the property crash I suddenly found time to do the writing I’d always dreamed of. I write full time now, and for me writing is one of those things – the more of it I do, the more I want to do. I love writing books with a chicklit feel, although so far I haven’t written in the first person. My natural writing style is light rather than heavy, and seems to fit well within that genre. My characters have a horrible habit of marching onto the page fully formed, which is great until they start to boss me about. If they have traits of real people I know it’s not usually deliberate. Some writers sit and make lists about their characters to get to know them, but I tend to get to know mine as we go through the novel. We definitely know each other better by the end than when we begin, because we spend so much time together. I’m always gutted to have to leave my characters behind, and when a book comes to an end, I’m always very sad. What was the inspiration behind The Vintage Cinema Club? The inspiration first came from a trip around vintage shops in Brighton. I came home and decided a vintage shop, shared by friends, would make a great setting for a book. I used to go to furniture auctions in an old place in Matlock, which used to be The Palace Cinema, and that was a perfect space to choose for the location, especially since Matlock has unexpectedly become the vintage capital of the area lately. I like to have the framework of a book in my head before I begin, and I make a lot of notes about that. Then I start to write. Some people say you should write a first draft without stopping, but for me it works better if I go back and edit and add layers to the scenes as I go along. It’s inevitable that there’s a lot of me woven into my books. I think if you write what you know, the writing is stronger, so I do that, but I do end up revealing a lot about my life along the way. But as no one knows which are the real bits and which bits are made up, that’s okay. What kind of research did you do before/during writing your novel? I tend to research as I go, and I do this more than I realise. I find that I can’t write in a wifi free zone, because I constantly refer to Google to check things. I like to write about places I’ve been to – I don’t over load my writing with descriptions, but when the small details I include are real, the book feels more authentic. Whenever I finish a book I miss that characters so much that I always want to write more. Series are more difficult to write than you would imagine, because the continuity has to be spot on. I’m not sure my brain is big enough to hold all the information I’d need for a long series. It’s great getting a fab review, because I love to hear that someone has enjoyed the book. When a review is critical, I definitely try to take note of that, and learn from it. As for the bitchy one star reviews, it’s best to ignore those. Hopefully they say more about the reviewer than the book. I’m lucky to have a very supportive family, who cheer me on all the way, help me with a lot of techie stuff, and understand why dinner is burned again. It isn’t easy living with a writer, and my partner is very long suffering. My writing friends offer huge support too. When I first signed with Harper Impulse back in 2013, I hyperventilated for at least three months. This is my fourth book, and publication day is still really exciting, but it’s very tiring too, because of getting all the promotion posts in place. 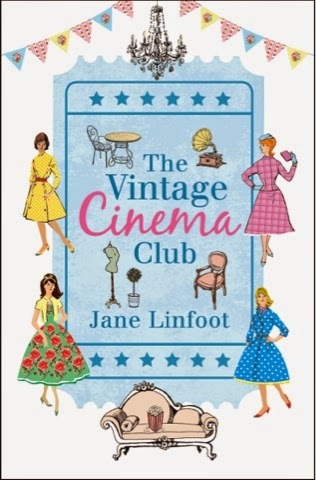 Jane Linfoot writes fun, flirty fiction, with feisty heroines and lots of heart. She lives with her family and pets in Derbyshire, and loves hearts, flowers, happy endings and all things vintage.